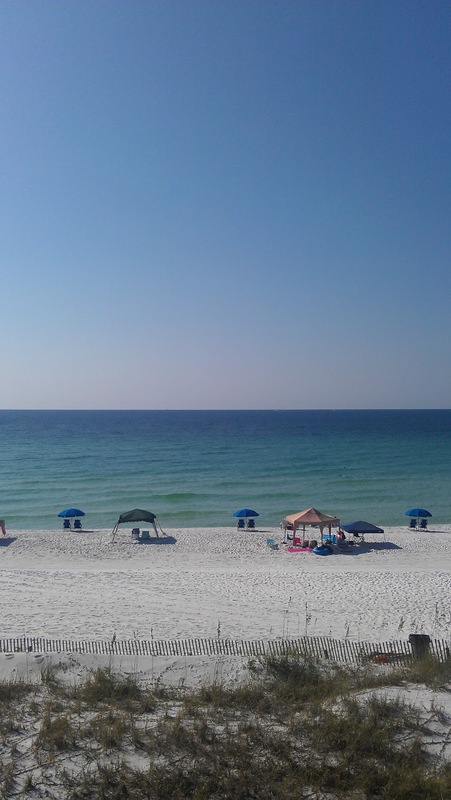 Last weekend my half-wife Michelle and traded the rainbow colored streets of Atlanta for the sun paved beaches of Destin, Florida. We decided to stay in a cute little motel called the Sea Oats. The motel was literally right on the water. 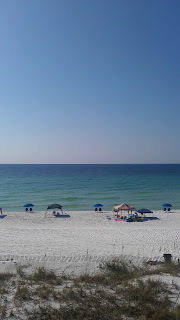 At night we could hear the sound of soft waves caressing the shore, and every morning, we awoke to the sound of children laughing and the smell of fresh water. It was amazing! Another perk of being on the beach in a quiet town is that there is no smog in the sky. The sky was so clear that we could see almost every star twinkling over our heads at night. One night, as we were straining our necks trying to determine which of the sparkling dots up above was the North Star, I got an idea. I wondered how the stars could be so far away and still seem so big and bright. Then I wondered which star was the biggest. The nerd in me got obsessed with the idea, so I decided to do a little research on big stars. I so surprised by what I found. Most of us look up into the sky and marvel at the size of our sun. Indeed the sun is big…but when you compare with other stars…not really. I found out that there is a star called Betelgeuse (yes, the movie Beetlejuice was named after this star) Betelgeuse is a part of the constellation Orion and it is super huge! How big is super huge, you ask? Think about it like this, Eta Carinae is a star bigger than earth but smaller than Betelgeuse. Eta Carinae is 5 million times larger than the sun and Betelgeuse is 300 times larger than that. Approximately 1 million earths could fit inside the sun. And are you ready for this 2 QUADRILLION earths could fit inside Betelgeuse. It is BIG! 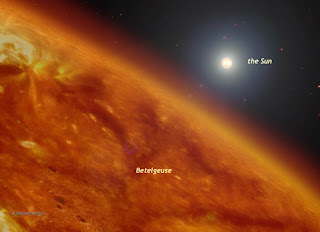 In fact, Betelgeuse is so big and so bright that it is draining all of the energy that it produces too fast. Many scientist believe it’s about to explode, because it can’t handle its own weight anymore. But get, this, Betelgeuse is not even the biggest star in our Galaxy, VY Canis Majoris is. VY Canis Majoris is one billion times the size of the sun. VY is also on the verge of explosion due to its size. I wanted to share this story because I feel like it has particular relevance in my life right now. Before last week, I had no clue that Betelgeuse even existed. I didn’t know anything about how big it was or that is about to explode, but now that I know it has changed my opinion of a lot of things. The first thing is that the Universe/God is far bigger than what we perceive it to be. The second is that bigger isn’t always better. So many of us spend our time trying to be “big.” We want to, “make it big,” “win big,” “do it big,” and so on. We think that bigger is better, but that is not always the case. The sun is nowhere near is as big as Betelgeuse and it’s just a grain of sand when compared to VY. But the Sun has something neither of those super massive stars have…relevance and stability. The Sun may not be the biggest star in the Milky Way but it is the best at doing what it does. So I guess we can look at it in one of two ways. We can spend our tying to be big…bigger than we may be able to handle or we can work to have longevity and relevance. As for me, my intention is not to be the biggest. My intention is to be the best at doing…what I do best.